The presence and general shape of latte art have a profound impact on consumers’ collective perceptions of value and even taste, according to new research from British and Australian researchers that included participation from three-time UK barista champion Maxwell Colonna-Dashwood. In a study recently published in the Journal of Sensory Studies, researchers made some illuminating discoveries related to value and flavor perception using lattes of the same recipe, with latte art as the only variation. Their conclusions add to the growing pile of research indicating that the visual presentation of food is a useful tool in manipulating consumers’ taste expectations and quality perceptions. In this case, they found that consumers were willing to pay 11 to 13 percent more for a latte with art than for a latte without it. The coffee shop in this case happened to be a world-class one: Colonna-Dashwood’s Colonna & Small’s in Bath, where the influential barista prepared art-topped and art-free lattes for the study. Test participants that were served lattes by Colonna-Dashwood, who is no stranger to science, collectively demonstrated no difference in general “likability” between the two latte types, although the participants served art-topped lattes were likely to pay 13 percent more for the product than those who were served artless lattes. When subjects were simply shown photos of lattes side-by-side in a broader internet-based test, the difference was 11 percent. 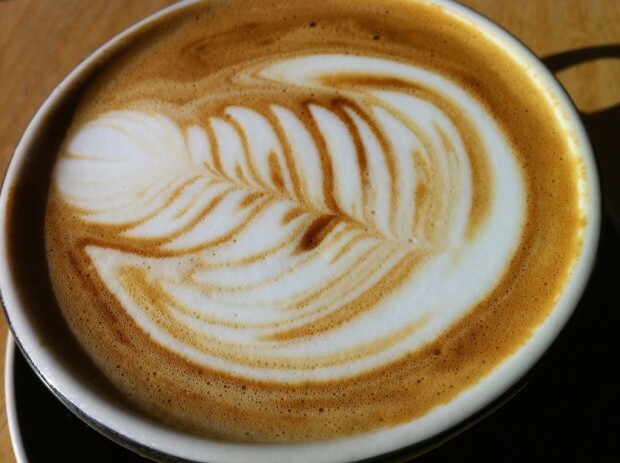 The shapes within latte art — specifically, rounded shapes versus angular shapes — had similarly significant effects on consumers’ expectations of taste, some of which defy previous research on food presentation as it relates to sensory analysis. Participants were shown two lattes, one topped with a star with angular edges, the other topped with a star with rounded edges. In addition to Colonna-Dashwood, the study’s authors include George Van Doorn, of Federation University Australia, Reuben Hudd-Baillie of Monash University and Charles Spense of the University of Oxford.